one more nice article. and very interesting! I recently tried to work with RAW, but it needs to change my process, so I’m very interested in your next articles… thanks for your work! The answer to above is as always it depends on what you are trying to achieve with the output. I can think of situations where each of the above might useful in specific processing/rendering intents. If you were to say well version x above best represents what my eye saw then this is not actually true, but if you saw version x best represents what my mind registered then this is more accurate. The eye can, at speeds faster then you can detect, auto-adjust exposure for different levels of light so to the mind see one image. This is a lot like how HDR works. It is difficult to say which version truly represent the actual scene as when I look at landscapes I se great detail in clouds and also deep in the shadows. JPEG and RAW each have there benefits and problems and for each photographer there is a solution that best meets their needs and will be different for others. There really is one is better than the other only if trying to overcome specific problems, such a exposure or WB correction, storage limitations or workflow needs. While I shoot in RAW for my needs I was glad that ACR will work with JPEG files, not to the full extend of RAW, but at least it is useful tool. I’m still wondering about my raw workflow, so I would definitely appreciate any information I can find on other photographers’ processes. I’m looking forward to the next few posts. If you are looking for maximum image quality and maximum latitude for adjustment, then RAW wins hands down. A .jpg image has the adjustments that the camera makes to it ‘baked’ in. 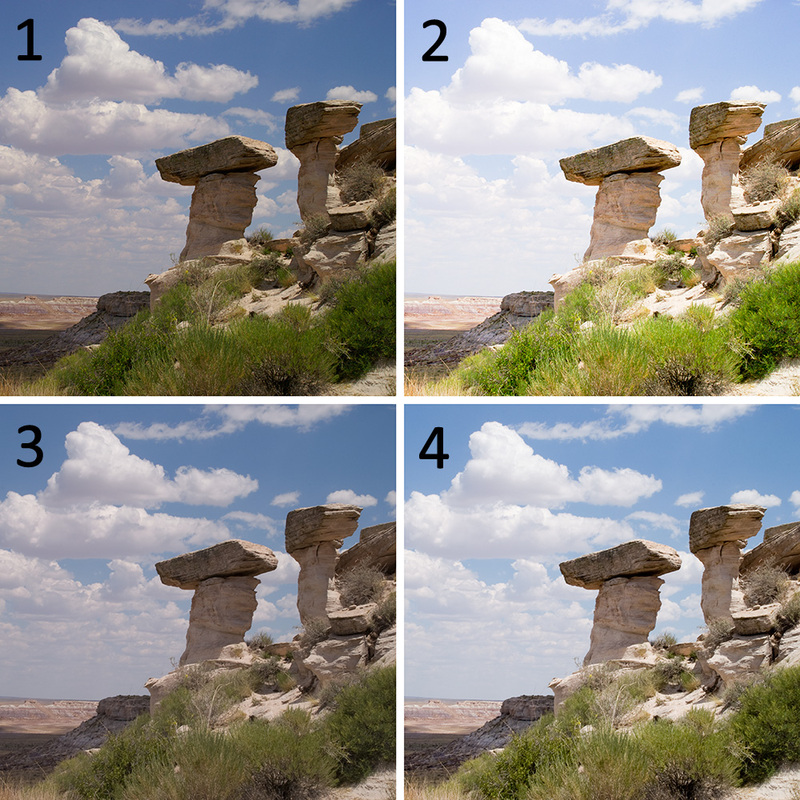 This includes white balance, exposure, brightness, contrast, and almost always some sharpening. The image is then dumbed down from 12 or 14 bits per pixel to 8 and then compressed. When you go to adjust an 8 bit file, each color RG&B has only 256 gradations from black to white. So if you do any significant adjustments to the exposure or color, you can end up posterizing one or all of the color channels, which results in a blotchy looking photo. You also have no good way to adjust the white balance once it is baked in by the camera. Same goes for sharpening, once it’s applied by the camera, you can’t remove it. A RAW file comes out of the camera unprocessed by the camera. The file contains 12 or 14 bits per pixel of data in a 16 bit space for each of the three color channels. No compression or in some cases lossless compression is applied by the camera. With 12 bits of data you have 4,096 gradations for each color channel between white and black and with 14 bits of data, as most new DSLR’s have, you get 16,384 gradations between white and black for each color channel. As you can see this gives you much more latitude for adjustment of the image. You can also set any color balance you like and in most cases you have the ability to adjust the exposure by up to +/- 2 to 3 stops. Now there are some situations where speed is of the essence, such as news and sports photography where photographers prefer to shoot.jpg as they do not have time to process RAW files and must upload their shots ASAP to their news organization for publication. In this case, care must be taken to properly expose the images so that minimal or no adjustments are required. The use of Auto Adjustment is clearly not useful in comparing the quality of any images regardless of the file format. Both of the example images can be made to look much better, and similar to each other. In any case, I use RAW because there is not doubt that the image quality is superior. However, there are many situations where having superior image quality is unnecessary, and creates extra work. The most humourous thing about these examples is that the unmodified jpeg has the most pleasing characteristics on my calibrated Apple Cinema Display. It is warmer, the highlights are intact, and there is lots of room for local adjustments. The whole argument surrounding raw vs jpeg is dead and buried because cameras now give you the choice to shoot one or the other or both. It’s no one’s business what “mode” one shoots in, no more than it was whether I chose to shoot black & white, colour transparency, print film, 8X10 neg, etc etc etc. The whole idea of “starting point” is one of the most annoying things in digital photography. Everything is expected to be manipulated, modified. The camera just can’t capture what it sees, or is it the photographer? My suggestion to you, would be to first try going out during magic hour and not during broad daylight. All the best! The really most humorous thing about comparing JPG and RAW is that they can not be compared except to the detriment of JPG. Those who shoot JPG may be totally satisfied with the results, because they are accustomed to seeing Commercial printing or that from Drug Stores and Walmart, so their JPG looks better. BUT the Advanced Amateur or a Professional and an Artist with the Camera is never satisfied with JPG. Like Ansel Adams or Weston and others who were the pioneers of top quality photography have said, “80% or more of the finished work is completed in the Darkroom.” To the advanced Photographer, today Digital RAW is the negative and Photoshop CS* is the Darkroom. Neither Adams or Weston and others would ever consider using a JPG to create a finished piece of work. Even artists who work with other mediums who wish to make Prints of their Oil or Acrylic Paintings and other pieces, would be much better off to shoot RAW. There is more control over the finished piece of work than anyone who does not shoot RAW can ever realize. Those who make comparisons who state that JPG is just as good as RAW when finished, _really_ do not know how to use Photoshop as do those who have been working in Darkrooms for decades, manipulating their negatives to create works of art using Photography as the media of choice.